AFTER failing to convince Cameroonian gunman Christian Epoupa to return to Zimbabwe, ailing Harare giants Dynamos have turned to former Warriors striker Kingston Nkhatha. The deal to rope in Nkhata looks set to be concluded in time for next Sunday's blockbuster clash against Highlanders. The Sunday Mail also understands that DeMbare coach Lloyd Mutasa finally agreed to readmit notorious midfielder Denver Mukamba after a marathon meeting between the technical team and the club's executive held last Friday. Exciting linkman Brett Amidu also completed his return to Dynamos during the week but the expected arrival of former Kaizer Chiefs and SuperSport United striker Nkhatha could be the major talking point. The 32-year-old Nkhatha was released by South African ABSA Premiership side SuperSport United early this month following the expiry of his contract. Newly appointed Dynamos president Solomon Sanyamandwe did not give away much but fell just short of confirming the move. "I think the best person to talk to is our chairman (Isaiah Mupfurutsa), he is the hands-on guy but what I can say is it's true we are chasing him (Nkhatha) and a deal could be thrashed soon. "Our coach Mutasa indicated that he wanted a top striker and we need to support him as the executive by giving him what he wants," Sanyamandwe told The Sunday Mail yesterday. DeMbare play Bosso in the Battle of Zimbabwe blockbuster at Barbourfields next Sunday and if all goes well, Mutasa could throw in the trio of Amidu, Mukamba and Nkhatha. 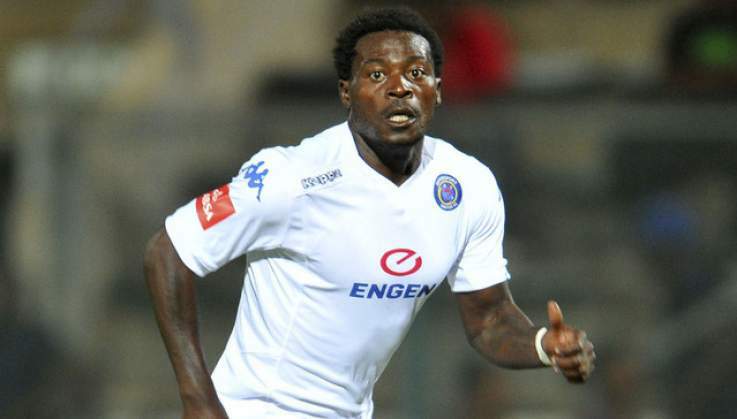 Nkhatha is a forceful striker whose last dance in the local Premiership was with Caps FC before he joined the trek to South Africa where he played for Free State Stars, Black Leopards and Kaizer Chiefs before signing with SuperSport United in January 2015. His contract with Matsatsantsa expired in June and the Pretoria based club decided against renewing the Zimbabwean's contract. And Nkhatha is now headed to Dynamos where he is expected to partner the newly acquired Munashe Kaseke who is back from the United States of America. Dynamos have struggled in front of goal this season, following the departure of Epoupa who banged 12 goals as DeMbare stunningly clinched second position in the 2017 Castle Lager Premier Soccer League race. The new Dynamos executive tried to convince Epoupa, who is owed in excess of $16 000 in outstanding signing on fees, to return to Harare but the Cameroonian was instead unveiled by Botswana side Orapa United during the week. The Harare side has scored 17 goals in 20 matches, at an average return of 0.85 goals per game and DeMbare's tally is only better than Chapungu, ZPC Kariba, Bulawayo Chiefs, Nichrut and bottom placed Mutare City. DeMbare are 13th on the log standings with 22 points, just three above Nichrut who occupy the last relegation slot. The former champions are yet to win since the resumption of the second half of the season three weeks ago. They drew 1-1 against Chicken Inn and labored to a 2-2 draw at Shabanie Mine before losing 0-1 to Ngezi Platinum Stars at Rufaro last Sunday. Pressure mounted on coach Mutasa during the week and with sources within the club saying the gaffer faced the axe before the decision makers made a last minute U-turn. Some members of the executive also wanted Mutasa to be given a four-match ultimatum, one which would have demanded he gets 10 out of a possible 12, but that move has since been shelved. Instead, Mutasa has now been given the green light to choose his own assistant and indications are that former Mutare City coach Joseph "Shabba" Takangaringofa could commence duty this week.